Joplin, Mo. 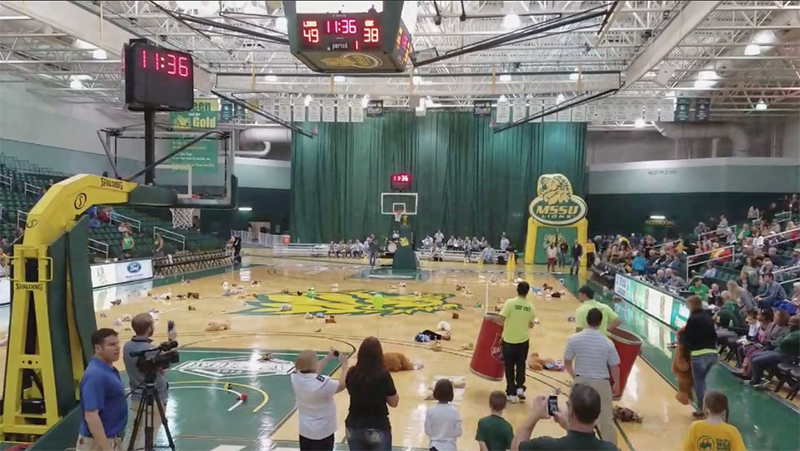 — On Saturday, December 9th, the Missouri Southern Athletics department will be hosting its annual “Toy Toss” event in conjunction with a Lions basketball doubleheader. Over the past two years, Missouri Southern Athletics has collected over 350 stuffed animals and other toy items at the event that were donated to a local charity for distribution to underprivileged children within the region in time for the holiday season. The Toy Toss will take place during halftime of the men’s basketball game, when all fans will have the opportunity to throw stuffed animals all at once onto the court for collection. Other toy items that cannot be thrown can be donated at the main entrances in designated Salvation Army collection boxes. If fans forget to bring a stuffed animal, ones will be available for purchase at the bookstore area located inside the Leggett & Platt Athletic Center. Saturday’s doubleheader is a conference matchup against Lindenwood University and will start with the women playing at 1:30 pm, and the men tipping-off at approximately 3:30 pm. Tickets can be purchased online at www.mssulions.com/tickets.